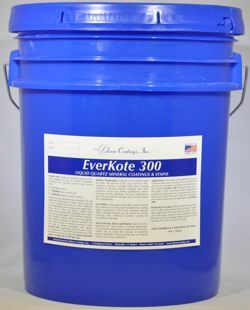 EverKote 300 coatings are waterborne inorganic paints and stains based on potassium silicate binders. Potassium silicate masonry paints have been in use for over a century to provide extremely durable, breathable color coatings on all types of mineral based substrates, including stone, masonry, concrete and cement plaster (stucco). Two standard grades are available: Penetral Low Viscosity, SemiTransparent Stains and Patinar Medium Viscosity, Opaque Coatings. EverKote 300 Dilution is a clear, waterborne, low viscosity penetrating dilution product based on potassium silicate binders. Dilution can be added to EverKote 300 EverKote 300 Penetral Stains and Patinar Paints at any proportion to increase transparency and reduce viscosity. EverKote 300 Primer is a clear, waterborne, low viscosity penetrating primer based on potassium silicate binders. Primer is recommended for consolidation of porous and friable mineral based substrates, including stone, masonry, concrete and cement plaster (stucco) prior to application of EverKote 300 Penetral Stains and Patinar Paints.